The concept of digestive enzymes is fairly easy to understand, but when delving into the details it is helpful to take a step back and understand what the myriad of available enzymes are actually performing within the body. While many separate enzymes are needed to interact with the food we eat, there are three amylase, protease, and lipase which are associated with the primary macronutrients in our diet; carbohydrates, proteins, and fats respectively. The pancreas is the primary organ responsible for the production and release of amylase, protease, and lipase. As a food bolus passes through the digestive tract, it stimulates the release of these important enzymes to drive the efficient breakdown of carbohydrates, proteins, and fats into smaller particles which can be absorbed later in the digestive process and eventually used throughout the body. In addition to the pancreas, amylase is also released in saliva in the mouth and is known as salivary amylase. Amylase is responsible for the breaking of the bonds in starches, polysaccharides, and complex carbohydrates into easier to absorb simple sugars.1 Salivary amylase is the first step in the chemical digestion of food. This is one of the major reasons that it is so important for people to take time while eating and thoroughly chew their food. 2 This initial step in the digestive process is essential to the proper breakdown of food eaten and the ultimate liberation of the nutrients within to be absorbed later in the digestive process. As the starches, polysaccharides, and complex carbohydrates continue through the digestive tract, they are further broken down from additional amylase released from the pancreas into the proximal small intestine. Another important enzyme to the efficient digestion of food eaten is protease. It is responsible for the primary breakdown of proteins and polypeptides from animals and plants and for proline dipeptides from gluten and casein. Proteases are released by the pancreas into the proximal small intestine, where they mix with proteins already denatured by gastric secretions and break them down into amino acids, the building blocks of protein, which will eventually be absorbed and used throughout the body. While amylase and protease do a great job of breaking down carbohydrates and proteins, the body needs another enzyme for the breakdown of fats, oils, and triglycerides. This is where lipase functions. Lipase is necessary for the full digestion of fats to their smaller fatty acid components. Why do digestive enzymes matter? At times, food may not be digested fully as it passes through the digestive tract. A number of reasons may be at the root of this circumstance. This can result in the inefficient liberation of the nutrients in food. While this can be difficult to feel on a day to day basis, there are several things which can point to the need for a bit more focused digestive enzyme support. When someone is experiencing occasional gas, bloating, and / or indigestion, a supplemental digestive enzyme may be an effective solution. 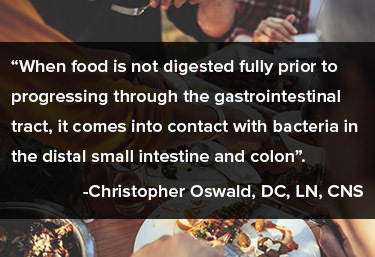 * 3,4 When food is not digested fully prior to progressing through the gastrointestinal tract, it comes into contact with bacteria in the distal small intestine and colon. Bacteria present in that area will ferment the maldigested macronutrients with the resulting byproducts being gases released to the digestive tract. This excessive gas buildup is what many people notice and initially report to their healthcare practitioner. Digestive enzymes including amylase, protease, and lipase represent a foundational aspect of gastrointestinal health. * Either producing them efficiently or supplementing when necessary are important considerations for today’s integrative practitioner. Christopher Oswald is a licensed nutritionist, chiropractor, and certified nutrition specialist. He has been in clinical practice since 2007 and currently practices in Wisconsin, in a general practice with a focus on digestive challenges, chronic fatigue, and overall health. In practice, he utilizes functional medicine principles to identify the underlying causes, which guides his direction for the appropriate clinical care. Additionally, he is the manager of education content for Nature's Way Products, LLC. Mackie DA, Pangborn RM. Mastication and its influence on human salivary flow and alpha-amylase secretion. Physiol Behav.. 1990. 47(3), 593-5. Suarez F, Levitt MD, Adshead J, Barkin JS. Pancreatic supplements reduce symptomatic response of healthy subjects to a high fat meal. Dig Dis Sci.. 1999. 44(7), 1317-21. Roxas M. The role of enzyme supplementation in digestive disorders. Altern Med Rev. 2008. 13(4), 307-14.